What Could Make Another Nashville Summer Even Better? Looking for fun this summer in Nashville? We have five things that are sure to make this a Summer of memories for you and your family! A GREAT city with GREAT music…sounds like the makings of another great summer. Right? While Nashville in the Summer can be brutal with the heat, there’s just something about great music in the great outdoors. Ascend Amphitheater has an incredible summer lineup planned. Besides Ascend Amphitheater, many outdoor concerts are planned across the area this summer. You can enjoy Jazz on the Cumberland on July 16th and August 20th. Details can be found here. Don’t forget Live on the Green! Nashville’s FREE outdoor music festival coming in August. You can find details here. Parents, you’re going to love this! Did you know you can register your kids to receive vouchers via email every Sunday for two free bowling games each day that week! All. Summer. Long. That’s a fantastic deal! You can find out all of the details here. Tomato Art Fest returns August 11th and 12th, 2017 for the 14th year! Located in Historic East Nashville’s Five Points, this free, costume-encouraged event provides a wildly entertaining, fun-filled day for all types and all-ages. A community builder, Tomato Art Fest has steadily drawn larger crowds with each passing year. In 2016, an estimated 60,000 came to celebrate this beloved fruit / vegetable and enjoy the day’s memorable festivities. Summer means open practices in late July and early August at St. Thomas Sports Park (45 Great Circle Road), followed by pre-season football at Nissan Stadium! Practice schedules will be announced online in the coming days, but the preseason home games have already been announced. August 19th the Carolina Panthers come to town. Kickoff is set for 2pm. On August 27th, the final home preseason game kicks off at 12pm against the Chicago Bears. Since Fall doesn’t officially begin until Friday, September 22nd, that means technically the Titans kick off the 2017 regular season this summer when the Raiders come to town on September 10th. Tickets are now available to all games. It’s no secret that Nashville has its eye on a professional soccer franchise. If you can’t wait until then, some huge games are coming to Music City, well, Soccer City this summer. On Saturday, July 8th, The United States Men’s National team plays in the 2017 CONCACAF Gold Cup game against Panama. Following the US game, Martinique takes on Nicaragua at 6:00 pm. You can get tickets here. July wraps up with two of the best soccer clubs in the world coming to Nashville on Saturday, July 29th! 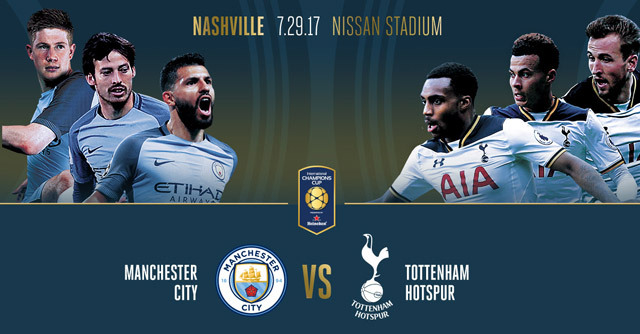 Manchester City and Tottenham Hotspur, will play in Music City this summer for the International Champions Cup presented by Heineken. Both teams are in the top of the renowned English Premier League. The two powerhouse clubs feature some of the top international talent from around the world. You can get tickets here.